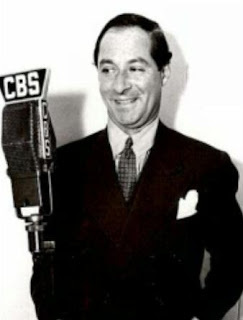 George Jessel (1898-1981), sometimes called "Georgie" Jessel, was an American actor, singer, songwriter, and Academy Award-winning movie producer. He was famous in his lifetime as a multi-talented comedic entertainer, achieving a level of recognition that transcended his limited roles in movies. He was widely known by his nickname, the "Toastmaster General of the United States," for his frequent role as the master of ceremonies at political and entertainment gatherings. Jessel originated the title role in the stage production of The Jazz Singer in 1925. Jessel was a big supporter of Israel. He headlined many Israel Bond and UJA dinners and made promotional films of his visit to Israel with his young daughter in 1953. Here he tells a joke that he was given by Cardinal Cushing who suggested that he retell it to the pope when he was traveling to Rome for an audience. Do you have any of Jessel's calls to his mother routines? In another version of the joke, the visitor is from Anheuser Busch. He asks the Pope to change the prayer from "Give us this day our daily bread" to "Give us this day our daily Bud". In that version, the Pope finally tells the visitor he'll think about it, then calls his cardinals together, and tells them, "Gentlemen, we need to reconsider the Wonder Bread account".